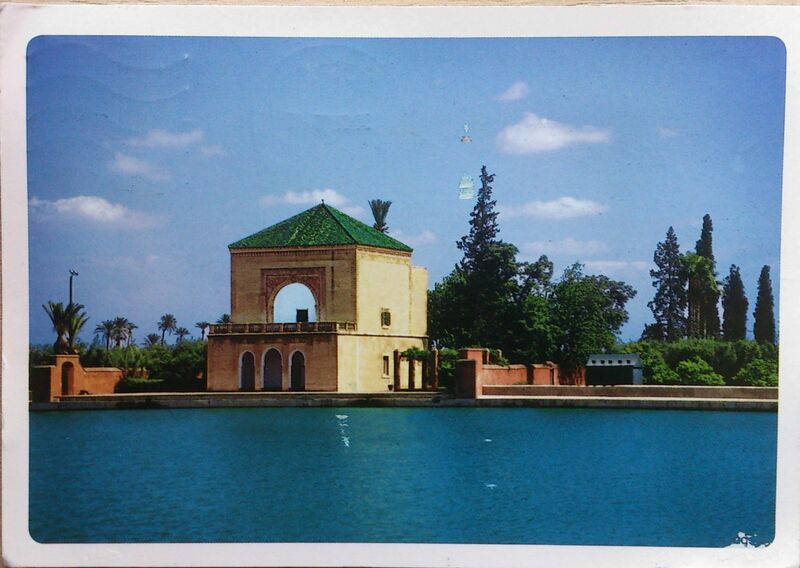 This card comes from Anas from Morocco and it pictures the Menara gardens, located to the west of Marrakech, Morocco, at the gates of the Atlas mountains. They were built in the 12th century (c. 1130) by the Almohad ruler Abd al-Mu’min. The name menara derives from the pavillon with its small green pyramid roof (menzeh). The pavilion was built during the 16th century Saadi dynasty and renovated in 1869 by sultan Abderrahmane of Morocco, who used to stay here in summertime. The pavilion and basin (an artificial lake) are surrounded by orchards and olive groves. The intention of the basin was to irrigate the surrounding gardens and orchards using a sophisticated system of underground channels called a qanat. The basin is supplied with water thanks to an old hydraulic system which conveys water from the mountains located 30 km approximately away from Marrakech.